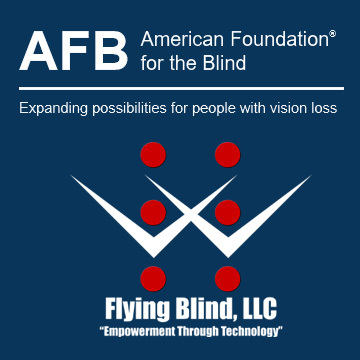 If you will be attending the AFB Leadership Conference being hosted this week in our nation’s Capital, please be sure to connect with Flying Blind, LLC’s Founder, Larry Lewis, throughout the weekend. He’ll be participating in an Author “Meet and Greet” in the AFB Press Booth in the Exhibit Hall at 3:30 PM to discuss his soon to be released book, “iOS In The Classroom”, and looks forward to sharing his excitement and enthusiasm about the publication with all of you! He’ll also be conducting two presentations on Saturday morning. The first focuses on incorporating Cloud Computing into your vision impaired students’ technological tool kits. The second provides strategies for getting the most out of today’s GPS solutions. Get full event information at: http://bit.ly/1OSfyLQ, and check the conference agenda at: http://bit.ly/1QUPbg2 for presentation times and locations! Until then, travel safe! Savings: Offered here at approximately $600.00 USD off of their suggested list price each. Savings: Offered here at approximately $200.00 USD off of its suggested list price. Savings: Offered here at approximately $1,100.00 USD off of its suggested list price. SUBSCRIBE: Do you, a friend, or colleague wish to receive Flying Blind, LLC Publications? If so, please use or pass along our CAPTCHA-free sign-up link, which is: http://bit.ly/1irUr9E. You can also subscribe to Flying Blind, LLC Publications on the Flying Blind, LLC Website at: http://flying-blind.com or by (SMS) texting “FLYINGBLIND” to 22828. Any of these methods will provide you with an accessibly friendly and secure medium through which you can subscribe to our mailing list. Just enter your name and email address, click send, and begin receiving Flying Blind, LLC Publications. It’s that easy. WEBSITE: Visit Flying Blind, LLC online at http://flying-blind.com. FACEBOOK: Are you on Facebook? Stop by and “Like” Flying Blind, LLC to begin receiving Flying Blind, LLC Publications as part of your Facebook News Feed: http://facebook.com/flyingblindllc. YOUTUBE: If audio / video is more your style, you can follow Flying Blind, LLC on YouTube at: http://youtube.com/flyingblindllc. RSS FEED: If you prefer an RSS Feed, you can access Flying Blind, LLC Publications as they become available using: http://flying-blind.com/feed.xml. ONLINE STORE: Shopping for accessible technology? Check out the Flying Blind, LLC Online Store at: http://flying-blind.com/store.html. All products offered in the Flying Blind, LLC Online Store are products that Larry L. Lewis, Jr. either personally uses, or publicly endorses. Flying Blind, LLC is proud to offer free Shipping & Handling on all orders over $100.00 USD within the 48 continental United States. QUESTIONS: Tidbits are intentionally concise, and we know a lot of people may not understand some items because little explanation is given. If a particular Tidbit brings up a question in your mind, feel free to ask, and we will try to answer as time and knowledge permit. ARCHIVE: Visit the 2016 Tidbits Archive at: http://flying-blind.com/tidbits2016.html where you can grab back issues. CONTENT CONTRIBUTORS: Any information for future issues of Top Tech Tidbits may be directed to our editor, Dean Martineau, at: [email protected]. This article excerpt was sourced from the website Top Tech TidBits Blindness technology news (full copy) and the original article can be found at Top Tech Tidbits for Thursday, March 3, 2016 - Volume 550.